Event-Photos are excited to announce Tracey Wilkinson has joined our band of professional event photographers bringing us to 48 team’s nationwide. Based from Chorley near Preston Tracey and hi team will cover both indoor and outdoor events on behalf of Event-Photos in the north west and beyond. 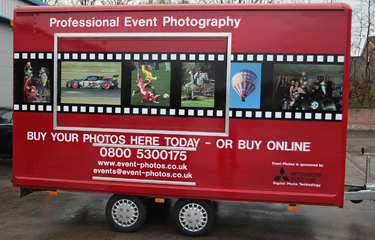 With full print on site abilities at indoor events and from his purpose built event photography trailer for outdoor sports events, Tracey's commitment to not just offering the best professional event photographic service but also a top notch professional presentation is second to none. Tracey is an Ex-Intelligence Corps Warrant Officer who was compulsory retired after 22 years’ service, perhaps a pointer to his undeniable attention to detail? Photography has been a passion of Tracey’s for 40+ years including photographic duties as part of his military career. After leaving the Service in 2011 Tracey took the bold step and started working as a full-time professional and is just approaching his first anniversary as a successful pro. After attending several courses in many different genres of Photography Tracey has settled on a selection of areas to specialise in including Event photography, mainly in the Northwest Liverpool, Manchester and as far as Carlisle. Tracey says "My partner Jackie is my assistant and number one sales person running the trailer whilst I swan around doing the easy bit with a nice camera. I do also have a number of professional photographers to call on for help at bigger events. I'll shoot virtually anything but last year was mostly football & rugby tournaments, track days, schools, weddings, portraits & baby shoots. As long as I'm behind the camera I'm happy!" Tracey uses Canon cameras and lenses as well as Mitsubishi printers for his quality print production at all kinds of events. Planning an event, party, ball, prom or sporting event in any of there areas? Manchester, Accrington, Stockport, Lymm, Padiham,Altrincham, Wilmslow, Knutsford, Skipton, Congleton, Bury, Leeds, York, Sheffield, Bradford, Bolton, Liverpool, Birkenhead, Preston, Wigan, St Helens, Blackpool, Fleetwood, Southport, Lytham St Anne's, Skelmersdale, Morecambe Whitehaven, Lancaster, Warrington, South Lakes, Windermere, Hawks-head, Kendal, Carlisle, Runcorn, Widnes, Chester, Burnley, Blackburn, Clitheroe, Haslingden, Castleford, Harrogate. Why not call us on 0800 5300175 to book a superb event photographer? Event-Photos are pleased to announce a new event photography team based in Kent, Danny Rhodes has joined Event-Photos expanding our coverage of the South East region. If you are planning an indoor or outdoor event in any of the areas listed below call us NOW! "It is a real 'feather in our cap' for a growing company like Event-Photos to be closley aligned with such an important manufacturer as Mitsubishi and this year our association will be much closer" said Ian Griffiths. More details will be released regarding the deal in the near future. Event Photos, the Nationwide UK Event Photographers have re-equipped! Event-Photos have updated all their equipment and software. "So what!" You might ask, "how does this affect me?" As one of our existing customers, this means the superb quality photographs you are used to are now even better, prints delivered on site are even quicker. Our new cameras provide bigger, better quality files, print sizes are expanded to a whopping 30"x 40" whilst maintaining superb quality. "What's changed?". New cameras from Canon Professional, New printers from Mitsubishi Digital Photo and the very latest event photography fulfillment software from ExpressDigital delivering your photographs even quicker than before. Ian Grififths of Event-Photos said, "This has been an exciting and expensive time for us, to re-new equipment and software that is working well is not an easy decision to take however we believe that if we are to remain at the forefront of event imaging in the UK then we have to take these steps". "Our focus, if you'll excuse the pun, has always been to offer the very best products and service to our customers. We want every potential event organiser, no matter how big the event is, to know that when they book Event-Photos they can rest assured that we are 100% committed to being the best. There are too many guys with a couple of ink-jets in the boot of their car attending events claiming to be event photographers, we are not amongst them! Our company motto is I believe very simple. "Be Professional, Do It Right" I insist this is applied to every aspect of our business. "Talk is cheap", put us to the test, invite Event-Photos to your next event and we assure you, you will not be disappointed! Event-Photos are proud to announce the formation of a NEW EVENT TEAM offering greater coverage of the West Midlands REGION. A well established and highly renowned photographer David Linney has joined the Event-Photos network offering enhanced coverage of the West Midlands and beyond. Dave and his wife make up the long established "David Linney Photography" examples of this seasoned professionals work can be found at www.dlinneyphotography.com as well as on the www.event-photos.co.uk web site. Dave has been eventing since 1997 and has combined his event work with weddings, journalism and PR work. Dave will be available throughout the 2006 season for all kind of indoor and outdoor events. 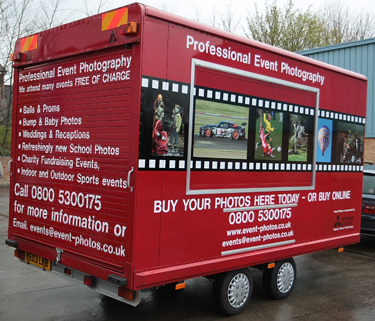 The appointment of Dave and his team brings Event-Photos event teams to 20 nationwide. Did you know Event-Photos can attend many events FREE OF CHARGE? Event-Photos will be at Rockingham for this years Modified Nationals as the official event photographers. We will be taking great action photos of you tearing around the track or rocketing down the strip, so when you’ve finished your drive, make your way to the Event-Photos display area and find your pictures, forever immortalising your heroic drive! After the event, all the photos will be posted on the web site at www.event-photos.co.uk If you would like a specific photo taking on the day, call the photographers on 07973 143406 and they will do their best to oblige. Event-Photos have joined up with Leukaemia Research to raise money through the sale of photographs taken at this years London Bikeathon of the riders having a great time. “Since the first London Bikeathon a fantastic amount of money has been raised for vital research into leukaemia, myeloma, lymphoma and the related blood diseases,” says Cathy Gilman, Director of Fundraising at Leukaemia Research. The event has the support of Match of the Day presenter and England football hero Gary Lineker, “We are hoping for a fantastic turnout, especially. It’s a really great way to have a bit of fun whilst raising money for a really important cause,” says Gary, whose eldest son George was successfully treated for leukaemia when he was just a baby. ”It’s a brilliant day out for family, friends and work colleagues; the fun doesn’t end after the London Bikeathon is over as there will be food, refreshments, and entertainment. So whether you are an expert cyclist, or haven’t been on a bike for years, it is a challenge that everyone can achieve!” he adds. Ian Griffiths of Event-Photos.co.uk “Our photographers will be located at the Royal Chelsea Hospital photographing as many people as we can as they ride past the hospital, regardless if you are a serious rider, in fancy dress or just out to enjoy the ride with a great bunch of like minded people you may get your photo captured, hopefully with a huge smile! At the end of the day, all the photographs will be posted to the www.event-photos.co.uk web site where they can be reviewed and purchased, if you can’t remember the web address there will be a link from the Bikeathon site to help you find the photos. The majority of the profit from sales is going directly to the Bikeathon funds to help continue the great research in to Leukaemia, Myeloma and Lymphoma. Event-Photos.co.uk the nationwide event photography company, announce that Mitsubishi Electric UK are to sponsor them for the 2006 event season. Ian Griffiths of Event-Photos says, “We are very proud of this achievement, this is a great compliment for Event-Photos to be sponsored by a giant like Mitsubishi Electric. Mitsubishi are the leading manufacturer of printers and media that is ideally suited to the rigorous demands of event photography. Over the years we have tried printers from many other manufacturers but all have their own inherent weaknesses, The Mitsubishi’s though are perfect for the task and have never let us down. We use the Mitsubishi printers in some of the most hostile environments you could imagine including hot, humid, dusty and sub zero conditions, just about anything the ‘Great British’ weather can throw at us, add to this that we run them from generators and these printers just soak up the punishment and keep printing out superb quality photographs that our customers love”. Event-Photos are pleased to announce the formation of a NEW EVENT TEAM offering greater coverage of the EAST ANGLIAN REGION. A new highly professional event team headed by Duncan Harris is now taking bookings for the 2005 Christmas party season, Santa's grotto's and other such events. Duncan and his team will also be available throughout the 2006 season for all kind of indoor and outdoor events. Duncan brings with him a wealth of photographic experience both in and out of the studio. The appointment of Duncan and his team brings Event-Photos event teams to 19 nationwide.